In my deepening into the Goddess, I have come to understand that she has been called by many names, Kali, Mary, Athena, Hera, Aphrodite, Isis, Ixchel, Sophia, Quan Yin, Tara, Mother Earth, Diana and so on. Each of her names has access to a unique identity trait that resonates with the name. Throughout my life I have also been called by many names and I recently became aware of the fact that each name has a different personality. Each one of my names makes me feel, respond and be in this world in different way. The Russian Beatrisa connects me to the spirit and mystery of Nature; the Armenian Beta reminds me of my victim self who gave her power away to everyone she loved and got tangled up in her empathy; the wild, experimental and self-destructive Betty was a name I was called by in my early 20s; the graceful, expansive and wise Beatris was awakened by The Great Goddess as she pulled me out of hell; Kundalini Yoga gave me the name of Sat Avtar, one who speaks eternal truth; and then there is the playful, silly and magical Be that I created in my search for freedom and joy. Most of my names were imposed by others, few I chose for myself. I am affected, changed and confined by each of these names. All of my identities cause different experiences, and if I take any of them too seriously, I can get lost in the illusion of that personality. The Great Goddess has been teaching me to be able to contain all of the names and identifications that cause me to react and practice non-attachment. To observe my reactions and release their hold on me. Most of us carry our self-images as if they were us, and they end up weighing heavy on our souls and our bodies. Have you been called by many names? Or maybe you have always been called by one name and that has become a concrete identity that is impossible for you to look beyond. If we restrict ourselves to a singular personality with its actions, then we become attached and resistant to the inevitable changes and transformations of life. We are all of our identities, and we are none of them. Our pure essence is beyond all identities. Our pure essence is Divine! The personalities and identities are like clothes that we wear. Our pure essence is also beyond all dualities. In this lifetime, I am embodying a delicious body of Divine Feminine, although my pure essence is neither masculine nor feminine. But, in this life, I get to learn from my female body and take care of her and love her as long as I embody her. Lately, people have been calling me “Goddess” and that’s quite a name to live up to. LOL. But, I trust the signs from the Universe and allow them to lead me on my destined path of Embodying The Goddess. The Great Goddess has shown me that, just like me, she has also been fragmented by the patriarchal society into many names and identities. I now understand that she is the Feminine Energy that is within ALL, infinite and omnipresent. She is the mother of cosmos who is pure unconditional love that brings life and death. 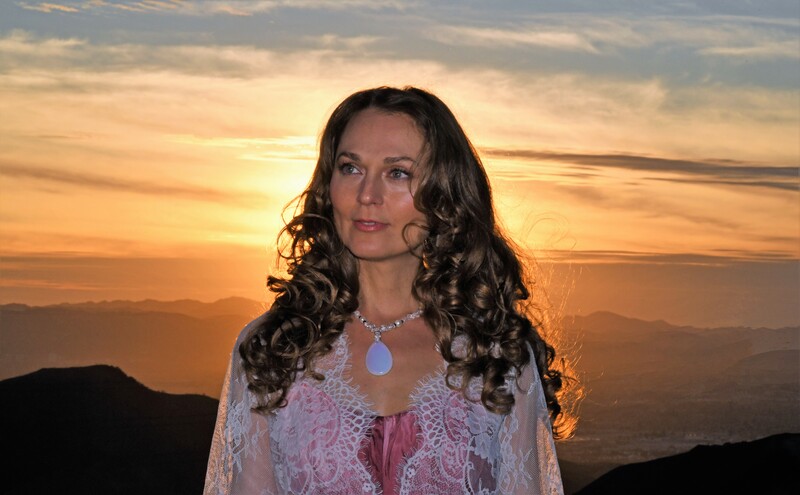 I am learning that Embodying The Goddess means to be connected to Divine Feminine and to shine her light with conscious awareness. It means to learn to accept and fall in love with all of my personalities and turn the ones that I consider my enemies into my friends and allies, so that I can become whole. Embodying the Goddess means to be able to shift from being kind to discerning to fierce to loving to playful in a split second without any attachment to any emotion or personality. It means knowing how to use Women’s Magic and Medicine to help and heal the world. It means to dive deeper into the ocean of Divine Feminine Soul and fly higher than the sun, further than infinity. Oh, Great Goddess, teach us, women, to be like you, show us the depth of our Divine Essence. Help us to understand who we are, so that we can become free again. Tell us what it means to Embody The Goddess. Please register for the Embodying The Goddess workshop by July 26. Receive healing and awakening in a safe and nurturing environment. Understand yourself better and learn to navigate your reactions to everyday challenges with, ease, compassion and joy. Find your freedom through Embodying The Goddess! Previous Why some heal and others don’t.